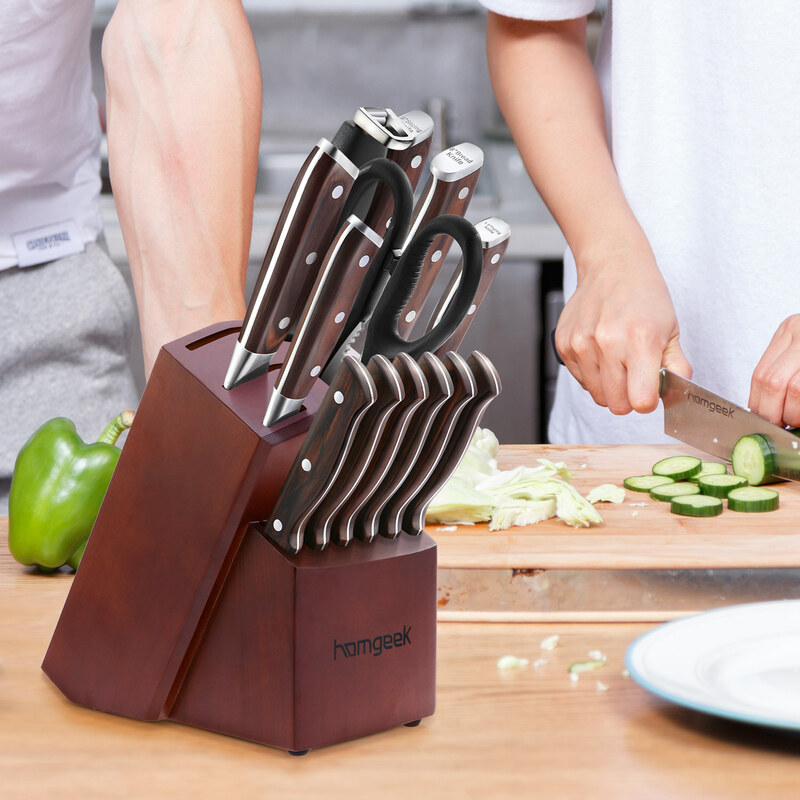 Save space for your Kitchen. 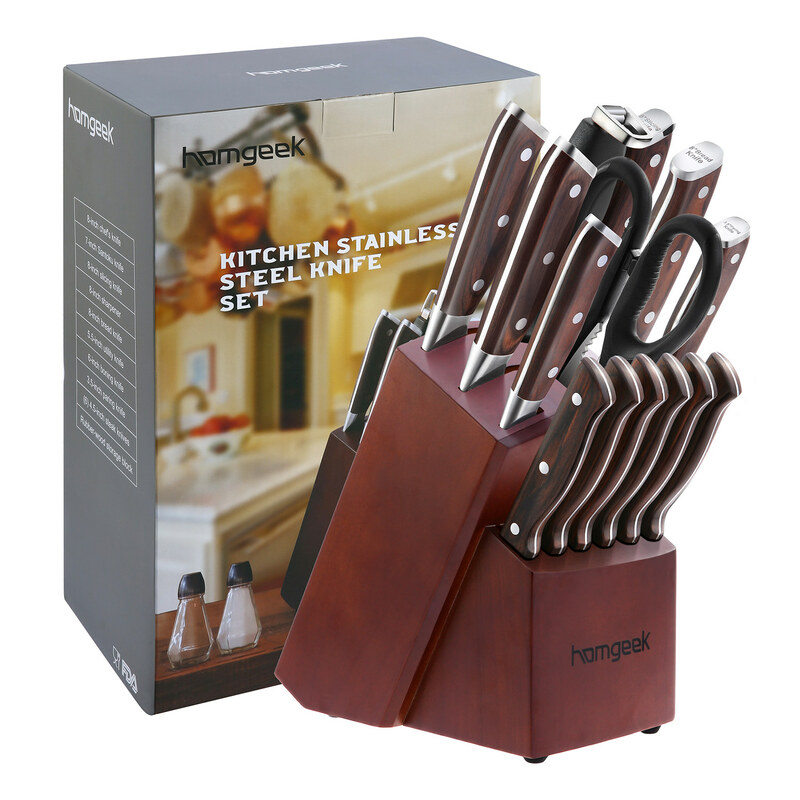 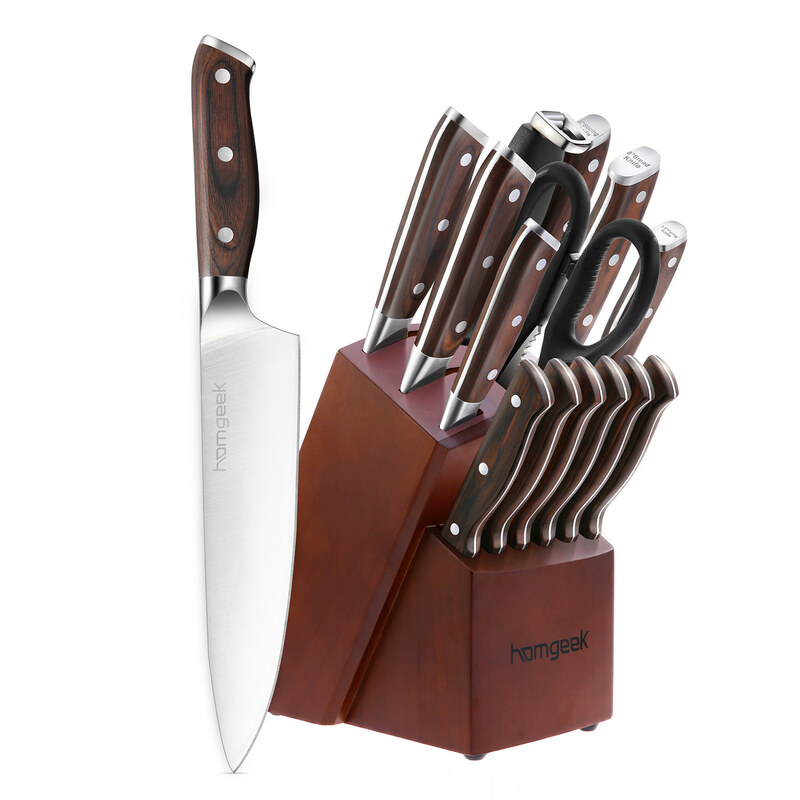 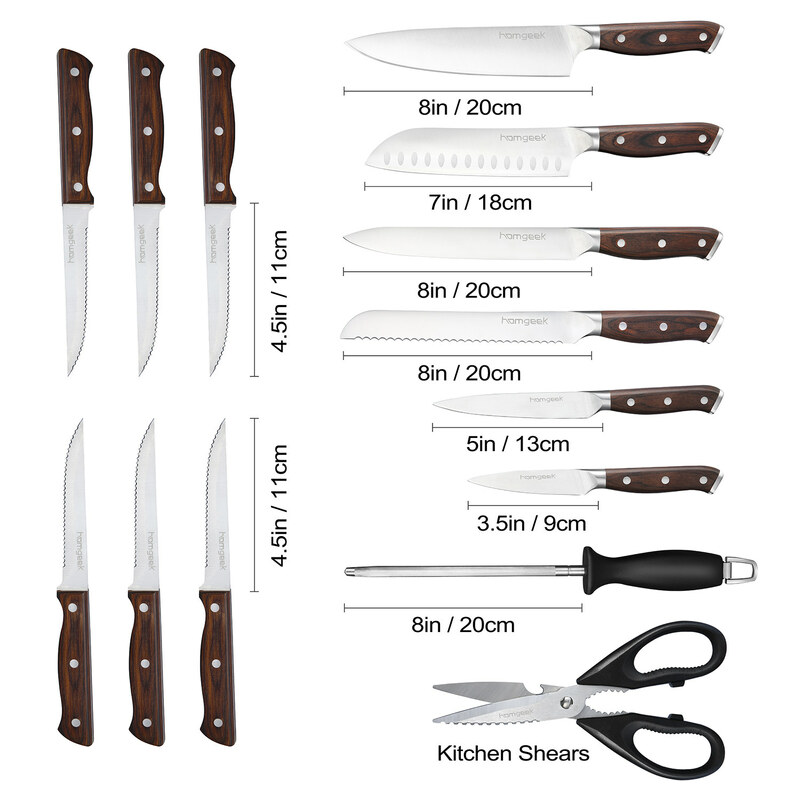 The knife set includes the wooden block, which is easy to manage your knife. 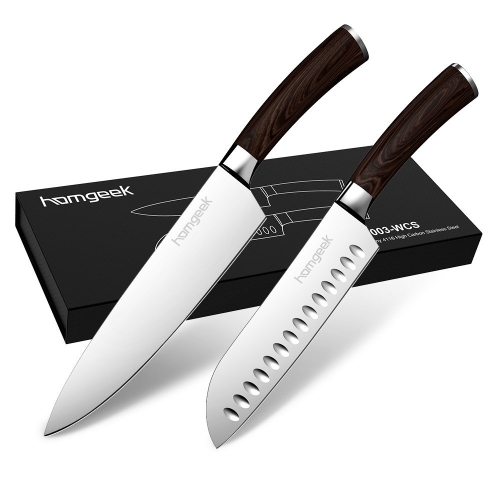 • Each blade is a precision forged, made from German X50Cr15 high carbon stainless steel. 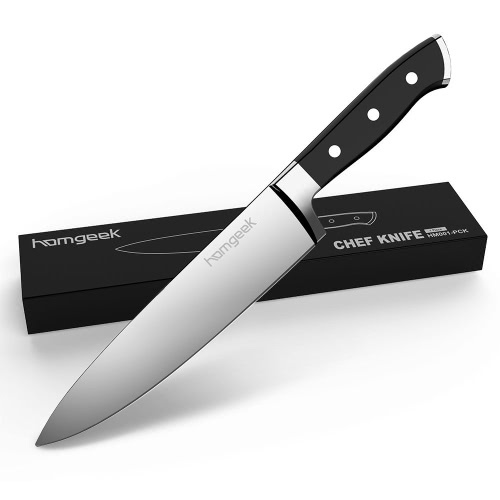 • The edge is painstakingly hand sharpened to 16-18° per side, ultra sharp,easy to cut any food. 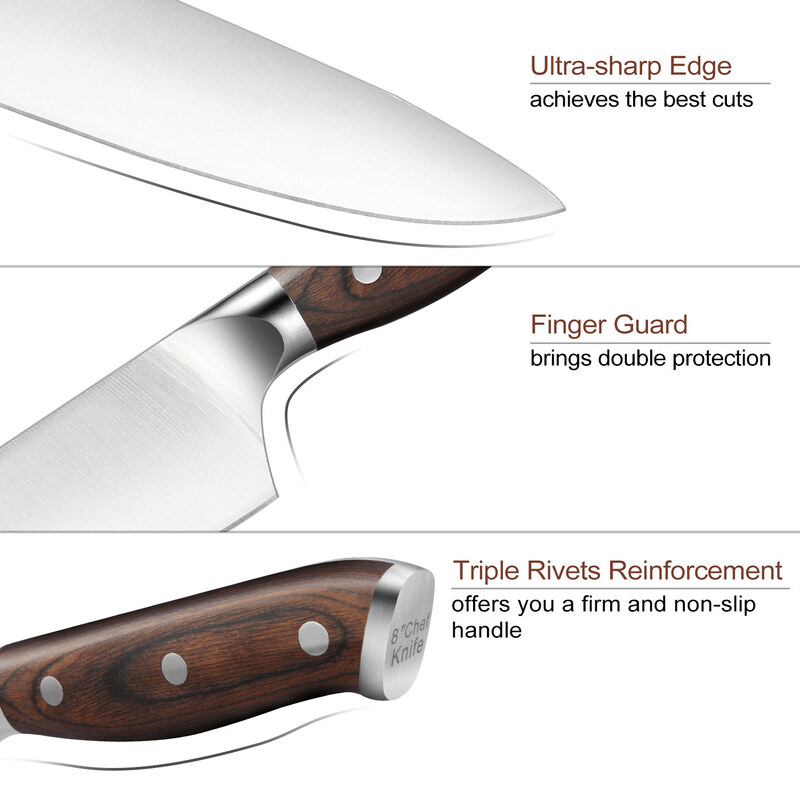 • Full tang for incredible robustness & quality,triple riveted for even more durability. 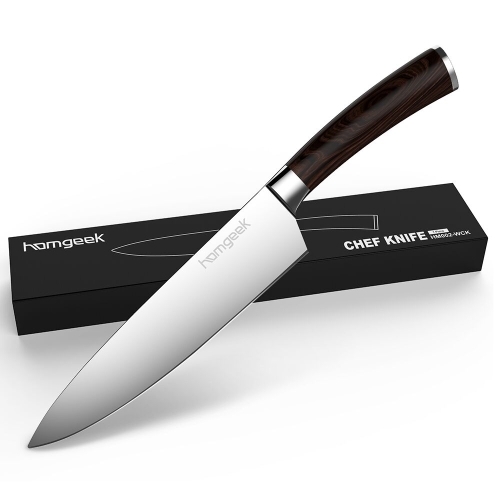 The edge is painstakingly hand sharpened to 16-18° per side, ultra sharp. 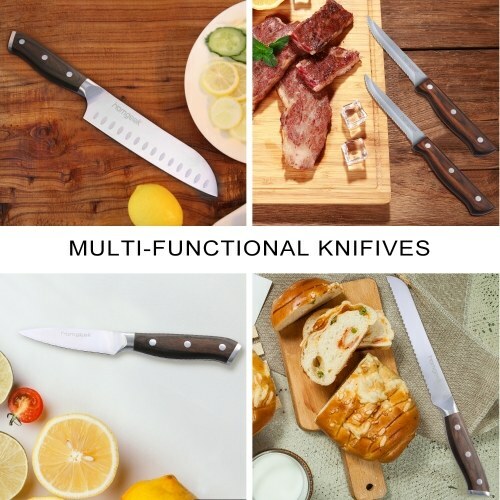 8" Chef Knife—A multifunctional knife with curved blade. 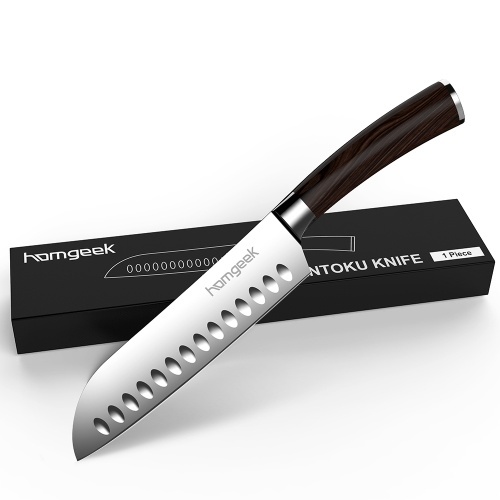 7" Santoku Knife—Slicing, dicing, and mincing. 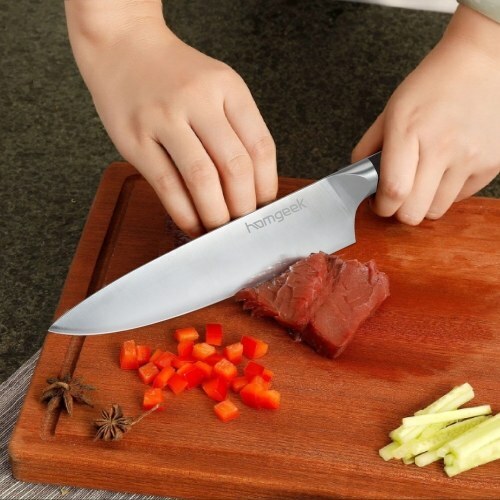 8" Slicing Knife—Cutting smaller and thinner slices of meat and fish. 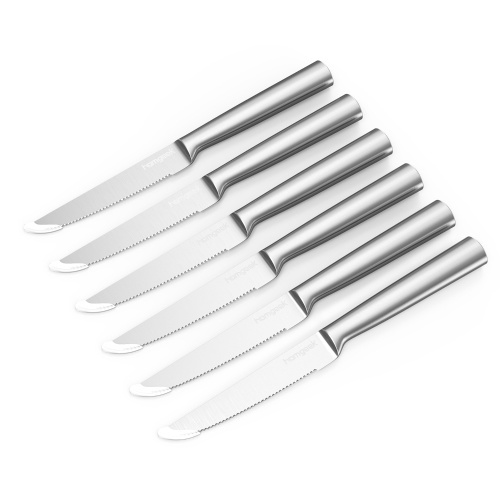 8" Bread Knife— Scalloped and serrated blade cuts bread. 5" Utility Knife—Designed to cut fruits and vegetables and remove fat or sinew from meat. 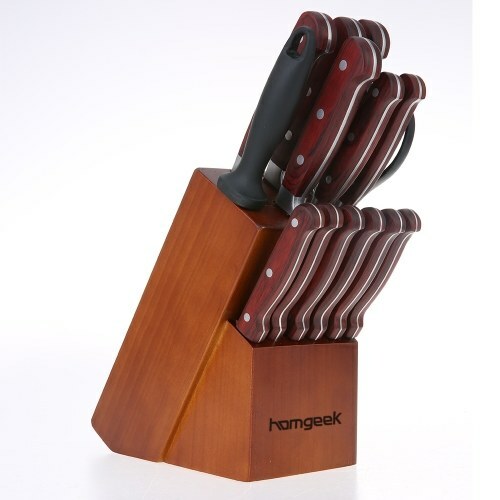 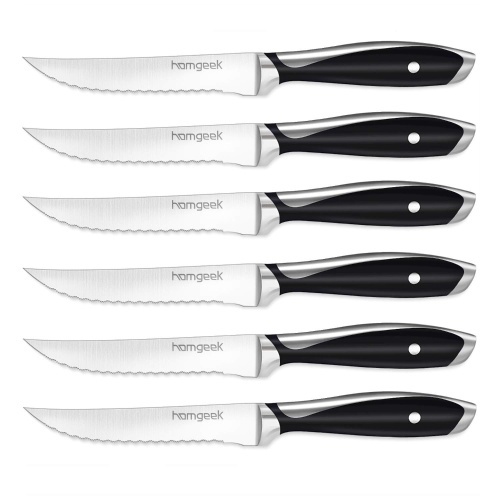 4.5" Steak Knives(6 pcs)— Steak knife with Serrated that segmenting steak easy. 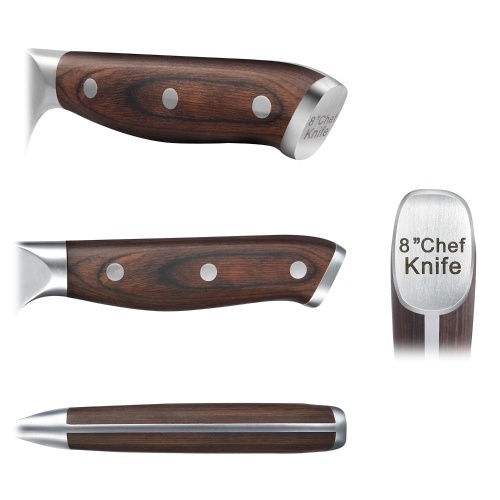 3.5" Paring Knife—Peeling, trimming and segmenting fruits and vegetables. 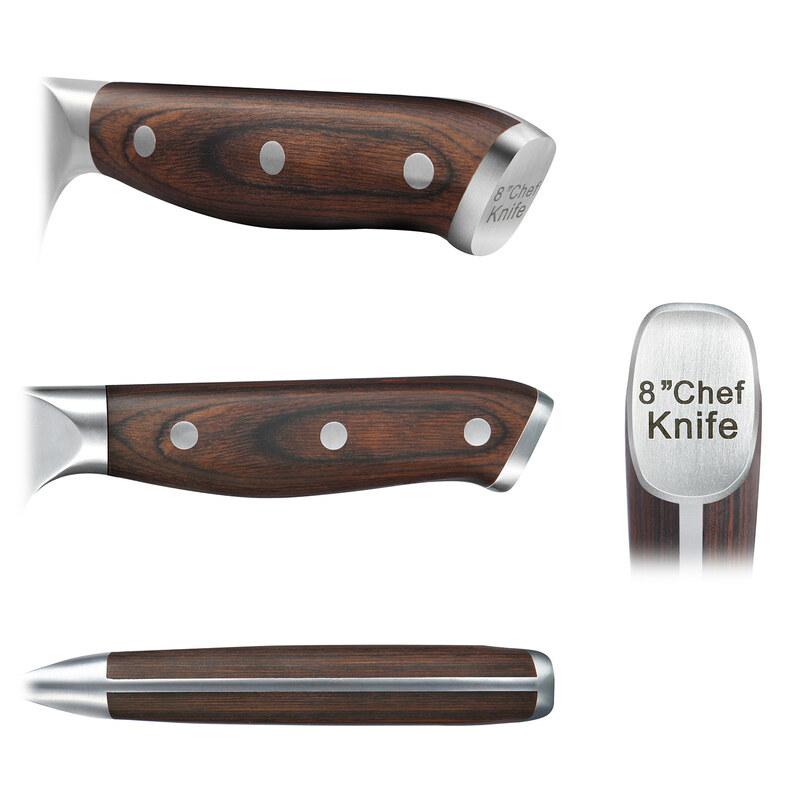 Knife Sharpener—Keeping in excellent condition will enhance chef capabilities. Kitchen Scissors—Cleaning skin off of poultry and trimming fat meat.